We have found that not all members of the public can or want to make prior arrangements for a trip. To meet their needs, we hold Open Days or Weekends twice a year when anyone who arrives at the mine (usually Wood Mine or Engine Vein) will be taken down in a small group. To make the trip easier and to add to the special nature of the Open Weekends, parts of the mine are floodlit and a circular tour is arranged. 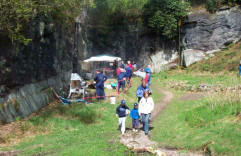 If you are however interested in arranging your own visit, please go to our page on visiting the mines at other times. Bookings can be made until 10:59 on 06/09/2019. At various times, we have displayed surveying work, history and chemistry of metal extraction, tool making, practical demonstration of rock drilling, smelting, cave radio and cave rescue. We also organise trips further into the mine for those interested and provide information about surface walks for those who do not want to venture below ground. The "caving" members of the Club were also involved giving demonstrations of rope and ladder work as well as talking to visitors about joining the Club. As usual these days, timed tickets will be issued according to the number of leaders available at any one time. Timed tickets will be available for booking before the Open Weekend but you can also get your ticket at any time on the day, giving you an opportunity to take a walk before you visit the mine. To book timed tickets on-line (up to 10:59 on 06/09/2019 or until all slots are full) click on the link in the box below. There are charges for admission. For more information, send an e-mail to the Open Days organisers or download our FAQs (Frequently Asked Questions). Please be patient and allow at least a week to hear back from us if you send an enquiry or e-mail. Open Days usually start at about 10 am and end at about 5 pm (last admission 4 pm). 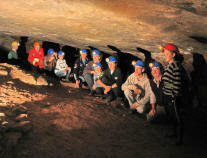 Besides being an opportunity to take members of the public around the mines, Open Days have developed into social events for the Club members. The Open Days have proved in the past to be a good time for anyone interested in joining the Club to get to know many of the active Club members. If you are planning to visit on an Open Weekend, you do not need to bring any special equipment but you should wear reasonable footwear and clothes which are NOT NEW as they may get a bit sandy or muddy. There are steps and, for some trips, a ladder that has to be climbed so you may be well advised to contact us in advance if you have limited mobility or special needs so that we can adapt the trip to suit your requirements. Click on the links to read or download promotional material about the Open Weekend. There is a full A4 colour poster and a black and white A4 version that can be made into three leaflets. The map shows how to get to the mine. This map is also available on a separate page suitable for mobile phones. The club has Open Days in April and September. When the date is fixed, the next Open Weekend will be publicised on this site and at the Information Centre behind the Wizard. The April Open Days are usually on the last weekend in April before the Bank Holiday, depending on Easter, and the September weekend is the first weekend in September. However, these dates cannot be guaranteed and you are urged to check this page before setting off specially to visit the mines. A charge is made for the led trips on Open Days in order to cover the cost of insurance and organisation of the event. Children are welcome but they must be in the company of a parent or legal guardian. 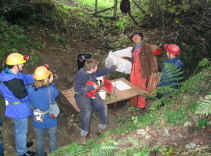 The caving club is not licensed under the Adventure Activity Licensing Regulations 2004 but payment is required for children (5 to 15 years) as the event is a demonstration of the Club's activities. For more information about the regulations and their impact on clubs such as ours, look at the page about legal issues or feel free to e-mail to the Club. We have published an assortment of photographs from previous Open Days. There is some feedback from previous Open Days on another page.